The Hieromartyr Eusebius, Bishop of Samosata, was an advocate of Orthodox faith and piety. Thus he was by name and deed pious, for this is what the name "Eusebius" means. Saint Gregory the Theologian, in a letter to him, calls him "a pillar and foundation of piety, a luminary of the Church and rule of faith." 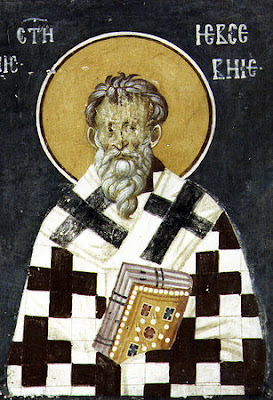 He lived in the fourth century, when the Church was facing the temptations of the heresy of Arius, who believed that the Son and Word of God, the Second Person of the Holy Trinity, is not perfect God equal to God the Father, but a creation of God created in time. However, if this was true, then salvation would be impossible, for only God has the power to save. Yet we know from Holy Scripture and the living tradition of the Church, that Christ came into the world to save it and to abolish the works of the devil. And His coming as Messiah and Savior was confirmed with miracles which He did and continues to do. The Church, naturally, reacted immediately, as a healthy organism reacts to the presence of a foreign organism, which can cause the organism various abnormalities or even death. And if an illness can lead to bodily death, the degradation of doctrine, directly related to our way of life and spiritual health, can lead to eternal death. For true death consists in the distancing of man from the life-giving grace of the Triune God. The Church, therefore, met at a Synod which was called by Emperor Constantine the Great and condemned the above heresy. This condemnation was not the result of fanaticism and intolerance, but an act of love by the Church towards its members, and even to the heretics, whom they do not regard as her enemies but as her sick members. But this genuine and unselfish love of the Church provokes all those who are unwilling to acknowledge their mistakes, even if they are convinced of them, causing reactions. The unrepentant heretics, who also had the protection of those in authority of that time, used every means to silence the Church. Those who were clergy, especially bishops, struggled to remain unalterable and faithful, and suffered persecution, exile or even martyrdom as did Saint Eusebius, who was killed by a heretical woman who was beating him with a roof tile on his head. Our rich Roman tradition, which is preserved in the mores and customs of the people, disturbs at times some who have not been fertilized with it and do not know its wealth and value, and they consciously or unconsciously fight it. The struggle in order to preserve its integrity, is not an act of intolerance and obscurantism. On the contrary, it is an attempt to save the way of acquiring illumination and deification. "No religion, for God's sake! The Greek nation does not consist of Byzantines, do you understand? Modern-day Greeks are direct heirs of the ancients. Then they too became civilized and prospered. They are in step with the other nations. Where is the poetry in writing that 'Christ accepts the worship of the poor people' or that the poor priest 'offered God a sacrifice of praise'? And in describing the interior of the small temple, with its sleepy oil-lamps and blackened figures of the Saints all around! We don't understand these things. We want a short story which will be full of poetry, not prosaic reality." "The Greek nation, or at least its enslaved part, is still far behind, while the part which is free cannot accelerate forward enough, without the whole being torn apart as it is already being torn apart, alas!... A modern-day Graeculus who wishes to publicly be an atheist or cosmopolitan, resembles a dwarf standing on tiptoe and stretching to become taller or to appear as a giant. The Greek nation, the enslaved nation, but the free one no less, has and forever will have the need for its religion." "As for me, as long as I live and breathe and possess judiciousness, I will never cease, especially during these most resplendent days, to worshipfully praise my Christ, to lovingly describe nature, and fondly illustrate the pure Greek mores. 'If I forget thee, O Jerusalem, let my right hand forget her cunning. If I do not remember thee, let my tongue cleave to the roof of my mouth.'" Source: Ekklesiastiki Paremvasi, "Ἱερομάρτυς Εὐσέβιος Ἐπίσκοπος Σαμωσάτων", June 2000. Translated by John Sanidopoulos.